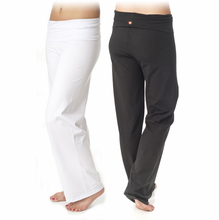 With an easy, full fit, these women’s wide-leg yoga pants in Certified Organic cotton are incredibly comfortable! Designed for your day-to-day eco lifestyle - from powering through your favorite yoga class to relaxing with your friends - you will surely enjoy their sustainable softness. The flattering roll-down waist lets you decide how to wear them. Also available in a long length pant for tall ladies! Great for yoga, sleepwear, lounging - you name it! Fabric: 92% Certified Organic Cotton - 8% Lycra for easy stretch. Made in the USA. By Beckons Organic. Fair Labor. Colors are from certified low-impact, environmentally friendly dye processes. We recently added this Review capability. Please help others by leaving your feedback when you receive a review request after purchasing this Women's Organic Cotton Yoga Pant from Yes It's Organic. While it would be foolish to think we can achieve a zero impact on our planet, we are whole-heartedly committed to minimizing our environmental footprint. We promote the efforts of organic growers. We buy only organic and sustainable fabrics. We manufacture our garments domestically whenever possible. We recycle our shipping boxes and avoid using poly bags. We recommend machine washing in cold water and laying garments flat to dry rather than dry cleaning. We promise to do everything we can to live a harmonious existence. If we don't eat it, why does it matter if it's organic? We believe there are four main reasons to buy and wear organic cotton clothing. Organic cotton is grown and harvested without the use of chemical fertilizers, pesticides and defoliants, thus protecting the farmers, air, water, and soil from toxic contamination. The fiber is not exposed to harsh chemicals along the way. In its final form it is longer and stronger, feeling softer on the skin. To the growing number of people with skin sensitivity, organic cotton clothing is a welcome alternative to non-organic cotton and other synthetic fibers that cause irritation and discomfort. We believe buying quality products that will last a long time and serve many purposes is one way we can limit our footprint. If you must replace pieces of your wardrobe, make good choices by buying quality products that will coordinate with what you already own. Make sure they fit well and will work for many different occasions. At Beckons, we are committed to providing enduring, flattering garments that can be worn to the yoga studio and throughout the events of the day. Our pieces can be layered with a suit and worn to the office. If we all make good choices, we can make a huge difference in the health of our bodies and our world. Click on the Manufacturer’s Story tab above to see a video of the story behind these products. “Based on the water research by Masaru Emoto, words have a significant impact on the structure of water. In his book, The Message From Water, he demonstrates the impact words, music, and art have on the water that it is exposed to by photographing the crystal formed when frozen. Water exposed to “love”, “thank you”, a beautiful symphony, results in a beautiful crystal. Quite a different crystal forms when water is exposed to negative words and images. Manufacturer's Care Instructions: To lengthen the life of Beckons garments and conserve precious energy, please wash your garment in cold water and lay flat to dry. Do not dry clean. c. The color stays more vivid when air dried. However, my [one of the co-owner's] children do the laundry and throw everything in the dryer. My Beckons items still look great and function perfectly. The hemp/Organic cotton/Lycra® pieces shrink if dried, they do much better when they are hung.